Ah, Troma… The company that brought us the Toxic Avenger series brings us this: Terror Firmer. This is the story of a New York low budget film crew, led by their insane and egostical blind film director, Larry Benjamin, who is trying to create a work of art. In addition to the typical trials and travails of a Troma set, the crew is preyed upon by a sexually conflicted, bomb-toting serial killer. Among the large poorly-paid film crew, the movie centers mostly on production assistant Jennifer, who struggles to do her job while deciding between the two men in her life; the straight-laced boom operator Casey, and the rebellious special effects operator Jerry. The love triangle intensifies as the dead bodies mount with increasingly brutality. At the climax, the entire film crew bands together (both physically and sexually) against the mortal threat in their midst. This is a Troma film, which of course means it’s weird, crude and dumd. And from Troma, that’s aa good thing. The only issue I had with this film is the fact that I watched the uncut version which was easily 20 minutes too long. 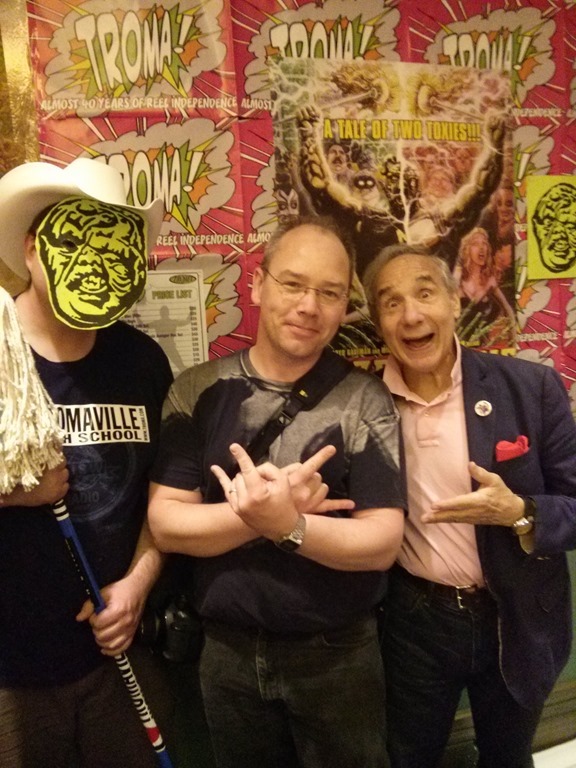 If you like Troma films, then this is for you – just watch the regular version.